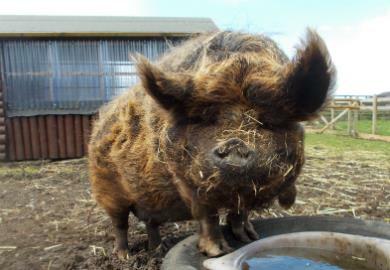 My name is Thelma am I am a Kune Kune pig aged approximately 10 years old. I’m a very friendly girl who is a real conversationalist and I do a very good impression of a shadow when I follow you around! My two favourite things are spending time in my wallow on sunny days or snoring away the day in bed. I’m happy living on my own but do like to have pigs living alongside me as we have a morning chat before breakfast.